Cruise Deals: Looking for Cruise Deals NZ ? Looking for Cruise Deals in New Zealand? You're not alone -- according to a story on Kiwi news website Voxy.co.nz, more than 14,00 holiday-makers will visit Lyttelton and Christchurch, NZ, over the remainder of January. 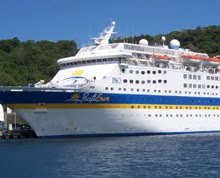 "With the summer cruise season now in full flight, Christchurch is preparing to roll out the welcome mat for 10 cruise ships during the last two weeks of January. The biggest day for the port will be January 28 when the Clipper Odyssey, the Nautica and the Sun Princess will all dock at the wharf for the day." "We are hosting three times more cruise visitors this season than we did just three years ago. Our numbers have leapt from 35,000 in 2006/2007 to around 100,000 this year, mainly from America, Australia and the UK. "